Limited edition Antique Brass with sculpture poppy. For centuries the whistle has been used to give battlefield signals. Traditional and well recognized commands that cut through the din of battle and brought a moment of order and command to the chaos of conflict. The famous Trench Whistle, sometimes called the "over the top" whistle. Solid Brass, the authentic sound of WWI. 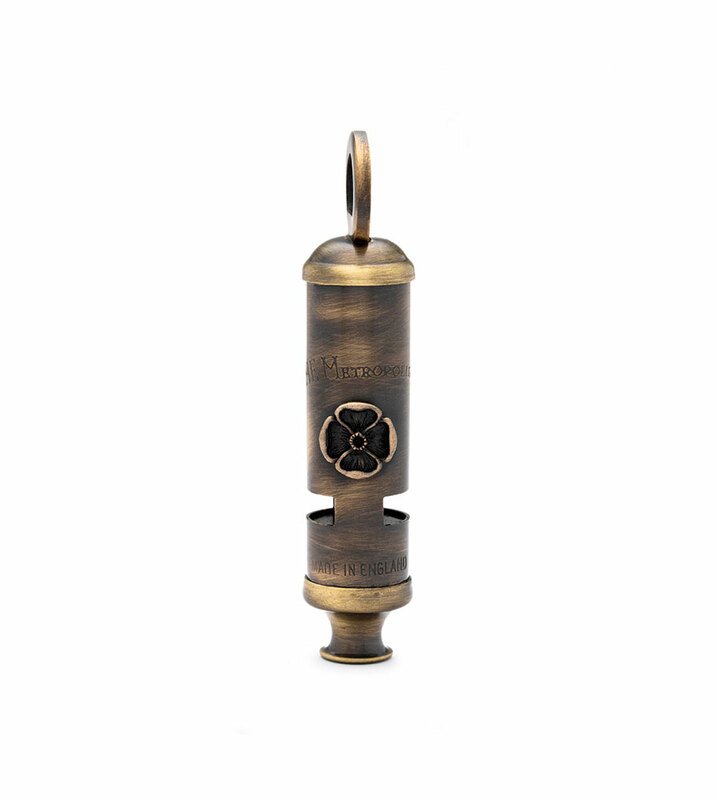 The official infantry whistle since 1884. Still produced in the same design in the original workshops in Birmingham to the original specification, using original equipment. Made throughout World War I and later in World War II. It is hand made in solid brass with a special Antique surface finish. Every whistle is individually tested and guaranteed to produce that same sound. Engraved with a poppy in remembrance of those we owe so much. Made to commemorate the end of WWI, 100 years ago. 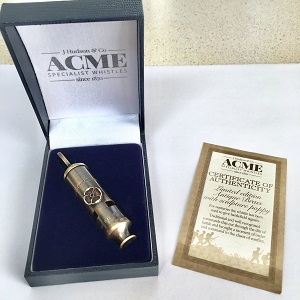 For every Peace Whistle purchased, Acme will donate 10% of the profits to the Royal British Legion - they do absolutely vital work to support the servicemen and women, veterans and their families in Britain. To commemorate the end of WW I, 100 years ago, this whistle has been specially produced bearing a sculpture poppy that acknowledges the debt we owe to those who took part in the struggle. More History For reasons now lost in the mists of antiquity, whistles were Joseph Hudson's passion. Throughout the 1870s he made numerous types and designs. But it was in 1883, as he played his violin and mused upon the idea he had conceived for a police whistle that fate took its hand. The London Police were looking for an idea to replace the hand rattle, so cumbersome and heavy, and no-one had ever thought of using a whistle. As Joseph Hudson put down his violin, he dropped it. As his violin hit the floor it murmured a dying note as the bridge and strings broke. On hearing that curious sound, Joseph Hudson knew at once that he had discovered the perfect sound for his police whistle. It's slightly jarring, discordant trill was unique and would, he knew, be far-carrying. He was right! When tested by the Metropolitan Police in London, in 1883, the whistle was heard over a mile away and immediately adopted as the official whistle of the London Bobby. It can still be seen on duty in the streets of London, and occasionally even heard.